I am always looking for new flavor combinations to spice up my old favorites. Preserved lemons give a burst of salty brightness far more complex than just a squeeze of lemon and a bit of salt. They are worth the effort. The food writers have gone mad for Sriracha chili sauce, showing up everywhere – a combination of chili peppers, vinegar, garlic, sugar and salt. I have discovered flash frozen wild caught Cod with each filet vacuum sealed. They can be defrosted in cool water in minutes and so handy to keep in the freezer. 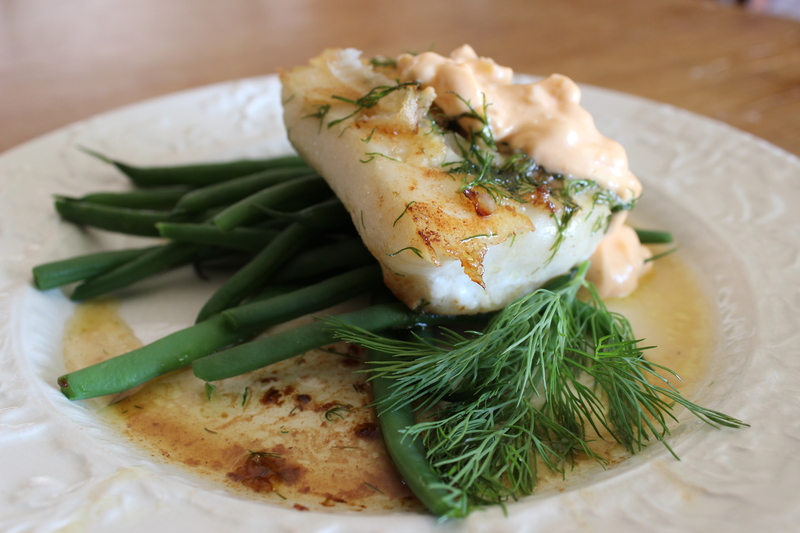 This entry was posted in Recipes and tagged Cod, Dill, Fish, preserved lemon sauce, preserved lemons, sauces, Sriracha chili sauce. Bookmark the permalink. I’m going to try your preserved lemon sauce!! I have sirachi and mayo in the fridge! I just did a post on preserved lemons and I’ve been looking for more ways to use them, so thanks! Great post! Thanks so much – I have been experimenting with basil preserved lemons and mayonnaise in the food processor – it is great stuff! That is so weird you just mentioned that! I read that comment in my dashboard and couldn’t figure out if I wrote it or you wrote it! (I thought I was drunk wordpressing!). I put mayo, capers, preserved lemons and fresh basil in the food processor the other day it it blew my socks off. I put a shallot in there too. I used it as salad dressing and ended up mixing some into mashed potatoes….best mashed potatoes ever. I’m going to duplicate it and do a post on it. Mama’s new secret sauce!! that’s so funny – I think we are both onto something great! Keep me posted on your preserved lemon experiments and I will add capers to my next batch.